To celebrate Open Championship week, I thought I’d post a few profiles of some of my favorite links courses in Great Britain and Ireland. If you haven’t done battle with these courses, you surely should. 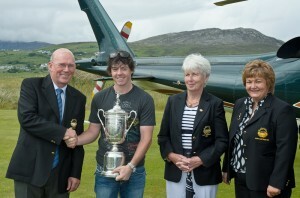 A relaxed Rory McIlroy, with U.S. Open hardware close at hand, is greeted by club officers at Ballyliffin GC. After lapping the field at the U.S. Open at Congressional, 22 year-old Rory McIlroy didn’t go to Disney World. Or jet off to a private retreat. Instead he flew straight home to Ireland and made his way to one of the Emerald Isle’s more unsung links golf destinations: Ballyliffin Golf Club in Donegal. McIlroy was there to do a photo shoot for Oakley, whose clothing and eyewear he sports on tour. Ballyliffin had won out in the competition to host the shoot, whose producers sought a natural links location in the north of Ireland. 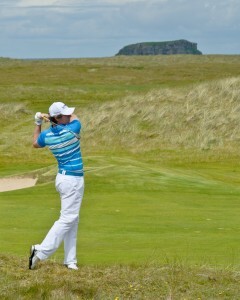 Also in the running were Royal Portrush, Royal County Down and Portstewart. 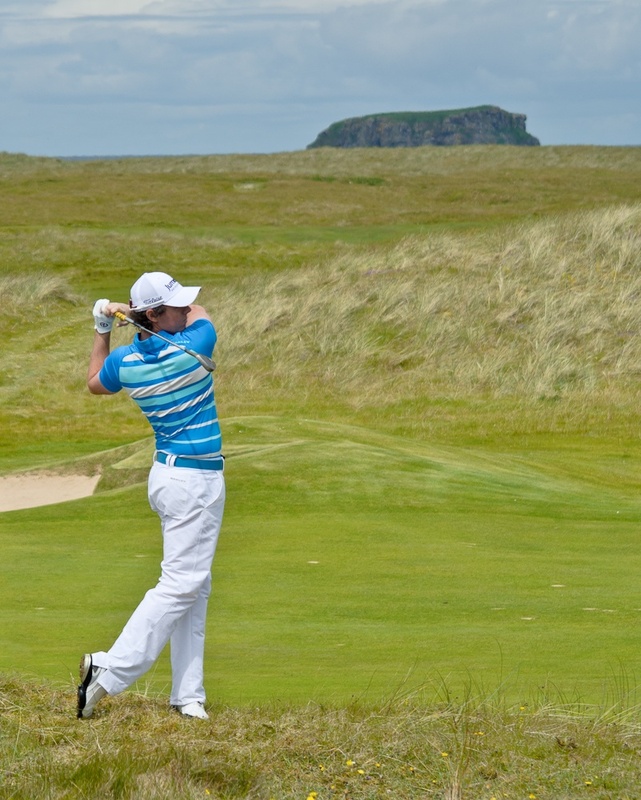 But Ballyliffin was the choice – and a fitting one at that. Ballyliffin was one of the first clubs in the world to recognize the outstanding young golfer when the club made him an Honorary Life Member in 2007 for his remarkable achievements as an amateur and for his contributions to Irish golf. McIlroy often competed at Ballyliffin as a youngster. In 2006, he was a member of the Faldo Series Team that spent a week at Ballyliffin under the tutelage of Sir Nick Faldo for an intensive week of coaching. That week culminated in McIlroy joining Faldo to officially open the club’s renovated Old Links Course. McIlroy calmly went out and shot 67 – a course record that still stands today. He was also a member of the Ulster Team when it captured the Irish Interprovincial Championship at Ballyliffin in 2006. And, he’s a past winner of the club’s coveted Scratch Cup. McIlroy is proud of his association with the club, just as the club members are proud that Ballyliffin is something of a second home to him. Ballyliffin is certainly a good place to warm up for an Open Championship. Its 36 stellar links golf holes may comprise the best 36 at one club in all the British Isles. 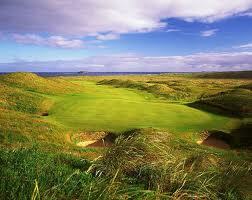 The Old Links Course, which Faldo reshaped, hosted a European Senior Tour event, The Senior Irish Open, in 2008. The course features a wealth of perfectly placed bunkers, undulating fairways and small, tricky greens that make it play far longer and tougher than its 6,937 yards might indicate. It’s an intimate course, with greens tucked in dells, and also a bold one, thanks to its three compelling oceanfront holes. The club’s newer course, The Glashedy Links, is simply spectacular – and as good a test of links golf as you’ll find anywhere in the golfing world. The Glashedy is a bigger course that plays in and out of the dunes that surround the property, offering unforgettable views of the coastline and majestic Glashedy Rock, which juts out of the ocean just offshore from the course. It has hosted many Irish championships and a European Tour event. At 7,220 yards, Glashedy can be both beauty and beast depending on the weather conditions. Even on calm and sunny days, though, its opening three holes present one of the sterner starts you’ll encounter; from the tips, these three par 4s (all playing uphill) measure 422, 427 and 426 yards. And from there, the course only gets better – if that’s possible – as you trek up and around coastal dunes that alternately soar and plummet right along with your golf shots. Finding the fairways is a must on both of these courses because as Farren points out in understated fashion, “The rough is fairly penal.” Avoiding the cavernous pot bunkers is also strongly recommended. Some are deep enough to hide Volkswagens in. Time will tell how Rory McIlroy does at Royal St. George’s in the 2011 Open. Should he win his second major in a row, don’t be surprised if he returns to Ballyliffin. Though he may not need it, the luck of the Irish certainly seems to shine on him here. I actually played that course with Joe Camel. Never will forget him actually laying down on the green and using the putter like a pool cue…sank it of course!